Well, have I ever told ya'll that I'm a big Disney fan? I love all things Disney--movies, gear, the characters (especially Mickey and Minnie), and of course, the happiest place on earth--DISNEYWORLD! In fact, when I was in high school, I did my senior theme on Mickey Mouse (a paper I absolutely loved writing). Just the other day, Lindsie was asked to say what cartoon character her mother is most like on her blog and she even said Minnie Mouse! So after I got over the initial shock of "what is this Sketch For You To Try with the six squares, oh dear friend, Jen? 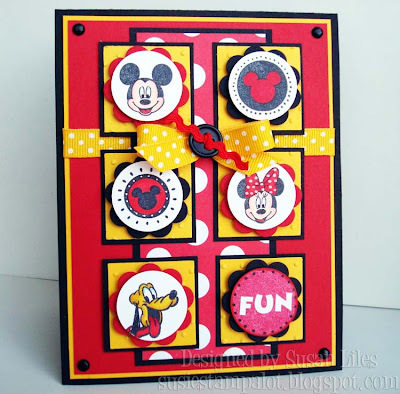 ", I knew that my newly found Mickey and Friends stamp set was about to get to work (Hi-ho, Hi-ho!). You see, I have a little Mickey Mouse on the brain (forever let us hold his banner high, high, high, high!!). About three weeks ago, we booked a trip to Disneyworld for the week of Christmas! We are lucky to have found a Disney travel guy extraordinaire that knows all the ins and outs and is letting us make payments on our trip up until the time we leave, making our dream completely possible. So all our extra money is going in the "Disney fund"! I've even talked the girls into having a Mickey and Minnie combined Birthday party in November to save money and I've almost got it planned out already. Yup, Disney on the brain!! Is it possible to be "too excited to sleep" for a whole year? Kelly (Kelly is taking the weekend off from SFYTT, but please go give her some love, as she has been selected as a Guest Designer for PapertreyInk! SUSIE Q-TIP: Use Grid paper to line elements up on your card. When it came time for me to adhere the six little squares to the polkadot layer, I used repositionable tape runner and lined it up on the grid paper and stuck it down. After that, I found the "center" on each side and lined up the middle squares and stuck them down and so on. Then when all of them were adhered, I just pulled up the whole thing and it was ready to put on my main card panel. Grid paper--I HIGHLY recommend it for your stamping surface. WOW! Susan, you made this sketch look so easy! I love what you've done with it! 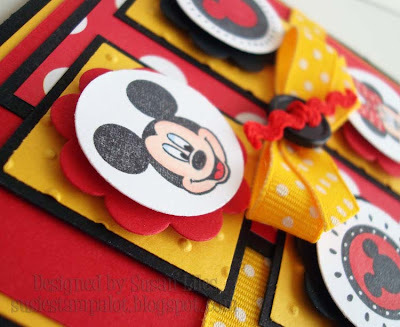 The Mickey theme is awesome! Well isn't this just the CUTEST! Love this, Susan!! It makes me happy! This is so bright and cute! I love it! We are surprising our kids tomorrow with a trip to Disneyland, so this has been on the brain! I would love to have this card to tuck in their Easter Baskets tomorrow to spill the beans! Adorable! Great card and a great tip!! This is truly MAGICAL! I am with you on the Disney thing, how can you not love it, it makes anyone smile! The card rocks! This card is the Bomb!! I love it and...all things Disney! you really rocked this sketch. Sounds like you're planning an awesome vacation! I love Disneyland at Christmas time! I've never been to Disney World, I hear it's bigger and better! WOW! WOW! WOW! I loooooooooove this. But, I believe that the happiest place on earth is DisneyLAND! :) LOL! this is absolutely ADORABLE!!! !